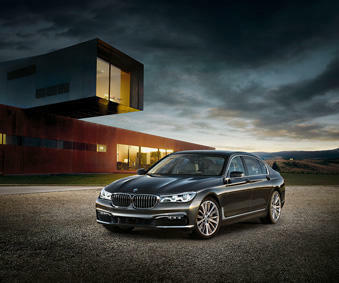 BMW has brought forth to the table ingenious technology, style, luxury and design with the new 2016 BMW 7-series. An ultramodern driving experience that exudes perfection describes this BMW 750 Li perfectly. The driver and their passengers will enjoy a copious amount of comfort, connectivity, operating systems, and an interior atmosphere that they will have never experienced before. The BMW 750 Li provides elements of presence, dynamics and elegance in every curve of the body. This 7-series style perfectly exemplifies the stability of the vehicle’s disposition. This vehicle includes accentuated surface design and perfectly established contour lines that bring attention to the car’s confidence and graceful presence. The BMW 750 Li comes in both standard and long wheelbase versions, which gives the driver differences in comfort with long distance travelling. The performance output of the BMW 750 Li is best described as impressive from one generation to the next. The 7-series BMW can be considered far more superior to other series of BMW because of the innovative and core features in possesses. The new BMW Efficient Lightweight feature contributes to weight reduction on this new model. The &50 Li is the first vehicle in the fleet that is built with manufactured CFRP, steel and aluminum combined. This conceptualization was created to strengthen the durability and reduce the overall weight of the vehicle. In the BMW 750 Li xDrive model, there is an Executive Lounge option that offers extreme comfort and satisfaction for a luxury car. This equipment option allows for electrical adjustment of the seats, a massage function and active seat ventilation. Also, this package includes a rear seat console and a rear seat entertainment experience with BMW Touch Command. The 750 Li also has automatic air conditioning with 4-zone control and a Vitality Program that encourages rear passengers to participate in physical activity. The BMW 750 Li’s exterior includes extended wheelbase versions for a look of detail on the exterior. This model also offers a stunning Sky Lounge Panorama glass roof, side-mounted LED modules and BMW Laser light; these are very prestigious features characteristics of the model. The laser headlights on the 750 Li give off pure white light while providing a high-beam range of 600 meters. This range is twice the range of LED headlights. The BMW 750 Li has chassis technology that is in the spotlight of design for this model. To improve the comfort technology in this model of BMW, the latest update of the Integral Active Steering system has been included, which now presents the option to exist with BMW xDrive and Executive Drive Pro systems. Roll stabilization and data based predictive functions are also present in the BMW 750 Li that is a first-time available option. If you are in the market for a vehicle that will give you optimal performance, style and technology, and you live in the Milton area, you should visit Budds’ BMW Oakville to test drive and get purchasing advice for a BMW 750 Li.